Bloodaxe Books marks its 40th birthday in 2018. This film by Pamela Robertson-Pearce and founder editor Neil Astley celebrates forty years of poetry with an edge - with readings, archive footage and visual snapshots of notable events over four decades. 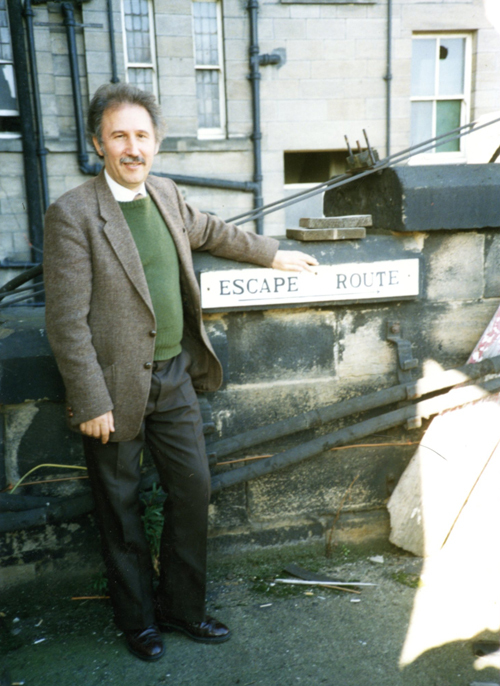 1978: Neil Astley sets up a small press in Newcastle called Bloodaxe Books. Ken Smith’s pamphlet Tristan Crazy is the first title. Clare Pollard is born in Bolton, Lancashire. 1979: Four pamphlets published, including two by John Cassidy and Fleur Adcock’s Below Loughrigg. 1980: Six paperbacks – including first collections by David Constantine, Tony Flynn and Nigel Wells, and Neil Astley’s Ten North-East Poets anthology – and an LP record of Basil Bunting reading Briggﬂatts. 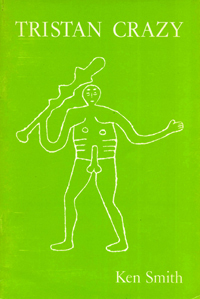 1981: Five titles including two pamphlets by Tony Harrison, A Kumquat for John Keats and U.S. Martial, and Ken Smith’s Fox Running and Burned Books. 1982: Douglas Dunn’s Hull anthology, A Rumoured City (with Philip Larkin preface), and Peter Didsbury’s debut collection, The Butchers of Hull, are launched in lively fashion in Hull (one poet ending up in hospital). Ken Smith’s first retrospective, The Poet Reclining, re-establishes him as a key figure in British poetry. Five other titles include first collections from Matt Simpson and Paul Hyland. Neil Astley and Simon Thirsk are founder directors of Bloodaxe Books Ltd, a limited company grant-aided by Northern Arts with a national distributor. 1983: Twelve titles including debut collections by Helen Dunmore and Sean O’Brien, and the first translations (Marin Sorescu and Leopold Staff). Frances Horovitz publishes her last short collection, Snowlight, Waterlight, before her death from cancer at 45. Leanne O’Sullivan is born in West Cork. 1984: Seven titles published: books by Hart Crane (first UK Complete Poems), Miroslav Holub, Paul Hyland, B.S. Johnson (House Mother Normal), Tom Paulin (essays), David Scott (debut) and Edith Södergran. Bloodaxe moves into its ﬁrst ofﬁce, in the old Exchange Buildings on Newcastle Quayside. Poet Brendan Cleary is the first employee. 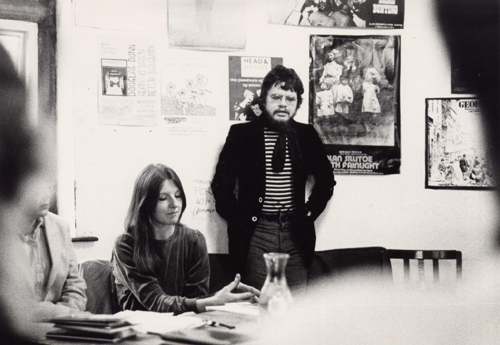 Simon Thirsk sets up the Evening Chronicle Poetry Competition in Newcastle, which runs for six years; winners include George Charlton and Linda France who later publish books with Bloodaxe. Niall Campbell is born on the Scottish island of South Uist. 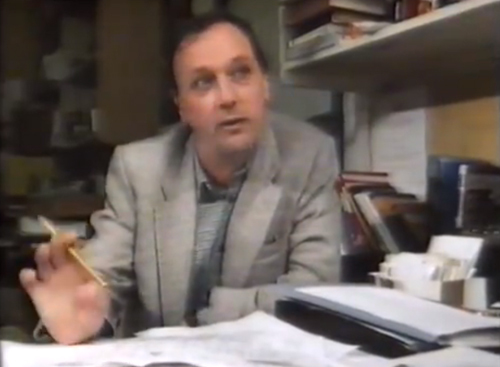 BBC North-East's TV arts review programme Gallery goes inside Bloodaxe in 1985, showing the making and publishing of the books as well as the running of the company. Here Simon Thirsk gives the business angle. 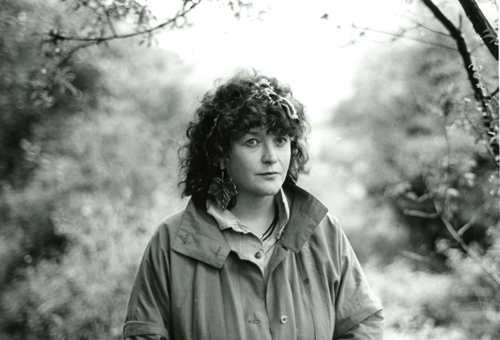 1985: A year of landmark titles, including Angela Carter’s Come unto these Yellow Sands (radio plays), Jeni Couzyn’s Bloodaxe Book of Contemporary Women Poets, Tony Harrison’s v. and Frances Horovitz’s posthumous Collected Poems. Sirkka-Liissa Konttinen’s Byker is the first photography title. But the programme is curtailed when the distributor goes bust and owing Bloodaxe thousands in sales income. One early supporter of the press sends a cheque for £1000 with a note: ‘I hope this will help. BBC North-East profiles Bloodaxe in its Gallery arts review series (see video at the foot of this page). 1986: A year of recovery and expansion with over 20 titles, including Irina Ratushinskaya’s No, I’m Not Afraid, published in May when the young poet was still imprisoned in a Soviet labour camp for writing poems considered ‘a danger to the state’, spearheading an international campaign which led to her release in October. Also Maura Dooley’s debut pamphlet, Ivy Leaves & Arrows, Jimmy Forsyth’s Scotswood Road (photography), and the first of many Bloodaxe titles from Andrew Greig, Kathleen Jamie, Jenny Joseph (Persephone), Denise Levertov and R.S. Thomas. 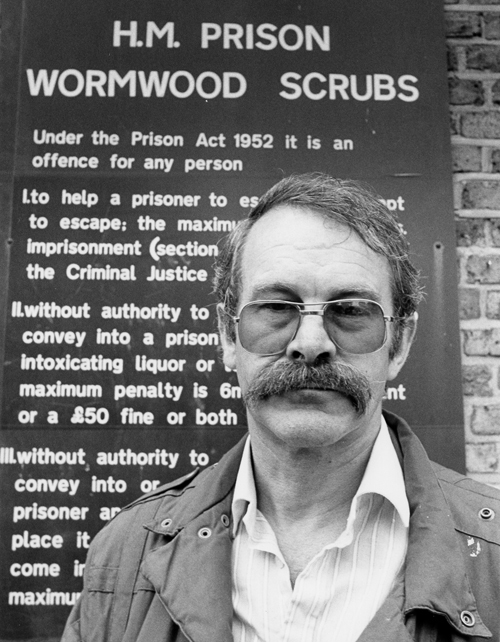 Ken Smith is writer-in-residence at Wormwood Scrubs (1985-87), one of the first such prison residencies, and appears on Wogan. Pamela Gillilan publishes her first collection, That Winter, at the age of 68 (but keeps that secret). Ahren Warner is born in Lincolnshire. Denise Levertov visits Newcastle to launch her latest collection, Oblique Prayers, with a Bloodaxe Selected Poems, her first UK publications for over 40 years, reading with the Raving Beauties at the Hatton Gallery. 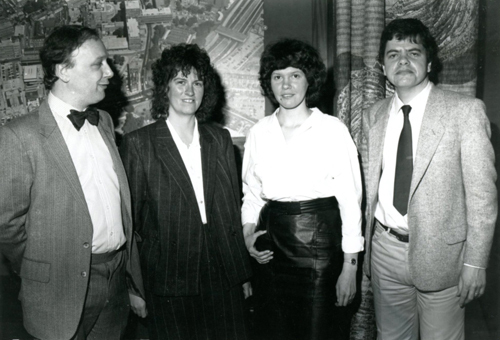 1987: Irina Ratushinskaya gives her first public reading since her release at Newcastle’s University Theatre in May and is honoured with a civic reception. Richard Eyre’s film of Tony Harrison’s v. is attacked by politicians and media before and after its Channel Four broadcast in November. 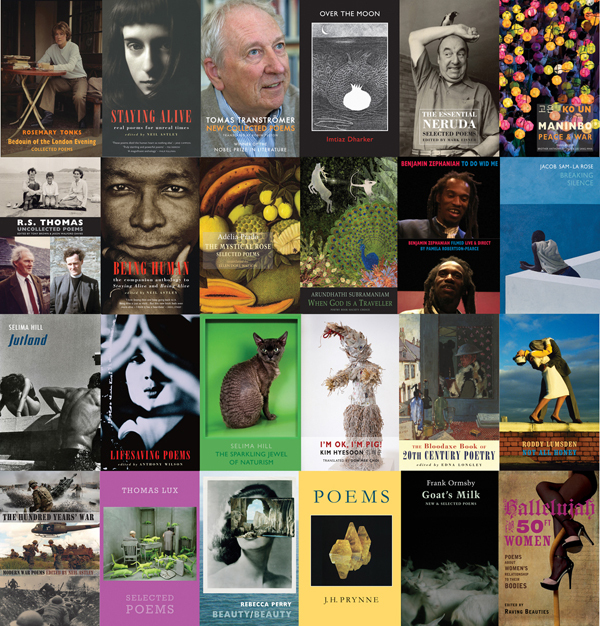 Another 20 titles by poets including David Constantine, Stewart Conn, Miroslav Holub, Brendan Kennelly (Cromwell, the first of many Bloodaxe titles), Ken Smith (Wormwood), Marin Sorescu, and the later Nobel Laureate, Tomas Tranströmer (his first Collected Poems). 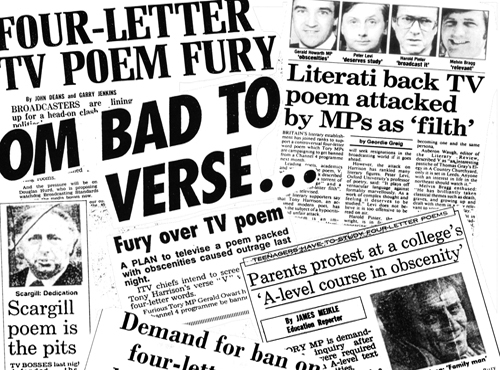 Tony Harrison makes headlines in 1987 over the Channel Four broadcast of Richard Eyre’s film of his controversial poem V.
1988: The press’s tenth birthday is celebrated with a two-day Bloodaxe festival in Newcastle featuring Miroslav Holub, Brendan Kennelly, Marin Sorescu, Tomas Tranströmer and C.K. Williams (launching his first two Bloodaxe titles), along with two dozen other poets reading from Neil Astley’s Poetry with an Edge. Other highlights include Martin Bell’s Complete Poems, Adam Czerniawski’s Polish anthology The Burning Forest, and Jo Shapcott’s debut, Electroplating the Baby. John Hartley Williams organises Gedichte mit Schärfe (with the British Council), the first Bloodaxe poets festival in Berlin. Deborah Randall wins the first (and only) Bloodaxe National Poetry Competition, her debut collection The Sin Eater appearing a year later. Bloodaxe survives as its second distributor goes under. 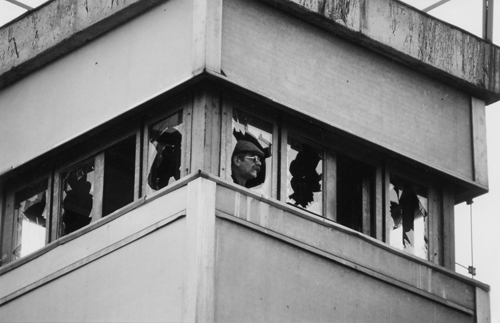 1989: Seeds of Fire: Chinese Voices of Conscience is published in response to Tiananmen Square. Ken Smith is in Berlin writing a book about the city when the Wall comes down. Other notable titles include Archie Markham’s Hinterland: Caribbean Poetry from the West Indies & Britain; debut collections from Simon Armitage (Zoom!) and Pauline Stainer; translations of Akhmatova and Hölderlin, and Richard Murphy’s The Mirror Wall; and a new edition of Tony Harrison’s v. which documents the media reaction to the TV film. Ken Smith, writing in Berlin before and after the Wall came down. 1990: Miroslav Holub’s retrospective Poems Before & After can be published following the demise of state control in Czechoslovakia. Ken Smith publishes Berlin: coming in from the cold with Hamish Hamilton, and his Berlin poems in Bloodaxe’s The heart, the border. Other titles include Ciaran Carson’s Belfast Confetti, Brendan Kennelly’s A Time for Voices, Glyn Maxwell’s debut, Tale of the Mayor’s Son, and translations of Odysseus Elytis, Sylva Fischerová, Tua Forsström and Eugenio Montale. Carol Rumens’s New Women Poets introduces 25 new poets including Linda France, Lavinia Greenlaw, Tracey Herd, Jackie Kay, Mimi Khalvati, Gwyneth Lewis, Katrina Porteous, Anne Rouse and Eva Salzman. Simon Thirsk's play Small Zones (based on the 1986 campaign to free imprisoned Russian poet Irina Ratushinskaya) is shown on BBC-2. 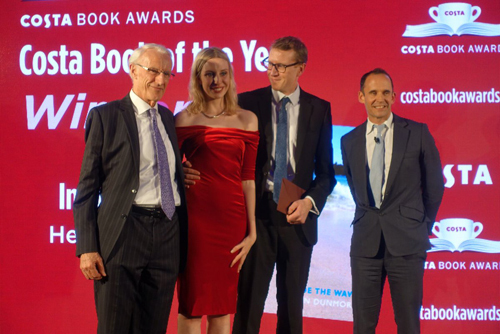 Bloodaxe Books wins Sunday Times Small Publisher of the Year Award. 1991: Brendan Kennelly’s The Book of Judas tops the bestsellers list in Ireland. Tony Harrison writes A Cold Coming in response to the horrors of the Gulf War. Debut collections from Ian Duhig, Elizabeth Garrett and Jackie Kay (The Adoption Papers); selecteds from David Constantine, Helen Dunmore, Linton Kwesi Johnson and Adrian Mitchell; translations of Osip Mandelstam, György Petri, Pierre Reverdy, Piotr Sommer, Rabindranath Tagore and Jean Tardieu. Bloodaxe moves office to Hawthorn House behind Newcastle Central Station – and is saved from bankruptcy a third time when company secretary Nansi Thirsk takes pre-emptive legal action against another failing distributor. 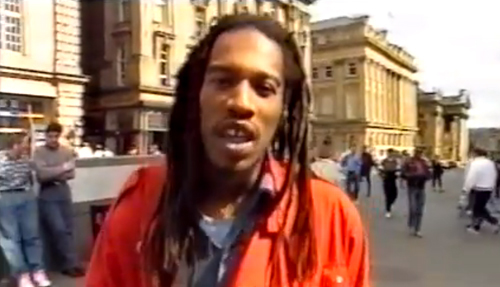 Benjamin Zephaniah reads his poem 'Money' on the hoof in Newcastle City Centre in the Tyne-Tees poetry series Wordworks. 1992: Tony Harrison’s The Gaze of the Gorgon wins the Whitbread Poetry Award. Bloodaxe works with Tyne-Tees Television on Wordworks, a six-part poetry series. Kamau Brathwaite launches Middle Passages during his Newcastle residency. John Hartley Williams organises a second Bloodaxe poets festival in Berlin (which can now include events in East Berlin). The Bloodaxe Contemporary French Poets series is launched with titles by Yves Bonnefoy, René Char and Henri Michaux; also translations of Gösta Ågren, Jacques Dupin, Holub, Lorca, Ratushinskaya, Sappho and Eira Stenberg. Other titles include Benjamin Zephaniah’s first Bloodaxe collection, City Psalms; selecteds from Harry Clifton, Lauris Edmond, Jenny Joseph, Micheal O’Siadhail, Lawrence Sail and D.M. Thomas; plus James Wright’s Above the River: The Complete Poems. Alison Davis joins Bloodaxe as marketing manager. 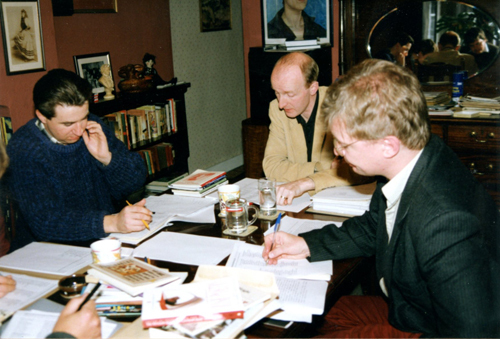 Historic anthology: the editors of Bloodaxe’s The New Poetry meet in Newcastle to thrash out their selection: David Morley (left), David Kennedy (centre) and Michael Hulse (right). 1993: Ken Smith and Judi Benson’s Klaonica: Poems for Bosnia is pulled together in days to support Feed the Children’s work for victims. The New Poetry (ed. Hulse, Kennedy & Morley) is the ﬁrst anthology of the new generation of British and Irish poets of the 80s and 90s, including key poets from the so-called ‘New Generation’. Linda France’s Sixty Women Poets celebrates two decades of poetry by women from Britain and Ireland, Selima Hill joins the Bloodaxe list with her fourth collection, A Little Book of Meat, and debuts include books from Katie Donovan and Anne Rouse. Translations include Attilio Bertolucci and Elena Shvarts. 1994: Gillian Allnutt (Blackthorn), Carolyn Forché (The Angel of History) and W.N. Herbert (Forked Tongue) join the Bloodaxe list. Kathleen Jamie goes Scots in The Queen of Sheba (‘whae do you think y’ur?’). Other key titles include David Constantine’s Caspar Hauser, Peter Didsbury’s That Old-Time Religion and Helen Dunmore’s Recovering a Body, and translations of Karin Boye, Hans Magnus Enzensberger (Selected Poems), Philippe Jaccottet and Mirjam Tuominen. 1995: Peter Reading moves to Bloodaxe with Collected Poems 1: Poems 1970-1984, along with James Berry with his retrospective, Hot Earth Cold Earth, Elizabeth Bartlett with hers, Two Women Dancing, and Tess Gallagher with hers, My Black Horse. Other notable titles include Aimé Césaire’s Notebook of a Return to My Native Land, and debuts collections by Julia Copus and Gwyneth Lewis (in English). R.S. Thomas’s final collection is No Truce with the Furies. George Szirtes edits Freda Downie’s posthumous Collected Poems, Brendan Kennelly tells the Irish, Poetry My Arse, and Neil Astley is given an honorary doctorate by Newcastle University for his work with Bloodaxe. 1996: Roy Fisher joins Bloodaxe with his first retrospective, The Dow Low Drop, Rita Ann Higgins with hers, Sunny Side Plucked, and Menna Elfyn with the bilingual Cell Angel. Peter Reading brings his account up-to-date with Collected Poems 2: Poems 1985-1996. John Fairleigh’s anthology When the Tunnels Meet is launched with readings by leading Romanian poets and their Irish translator-poets. Other key anthologies include Josephine Balmer’s Classical Women Poets, The Colonnade of Teeth: Modern Hungarian Poetry (ed. George Gömöri & George Szirtes), and The New French Poetry (ed. David Kelley & Jean Khalfa). Debuts include Eleanor Brown, Tracey Herd and Katrina Porteous. Marin Sorescu dies in hospital aged 60 after dictating his last poems to his wife from his sickbed over several weeks; these are later published as The Bridge. 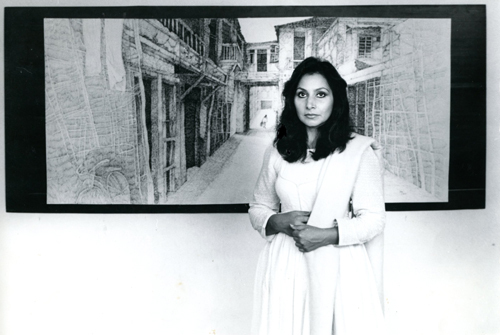 Imtiaz Dharker at an exhibition of the drawings included in her first Bloodaxe title, Postcards from god (1997). Her artwork forms an integral part of all her books. 1997: Bloodaxe splits its operation: Neil Astley takes editorial, rights and publicity to Northumberland (first Elrington, then Otterburn), Simon Thirsk moves finance, sales and marketing (with Alison Davis) to Bala in North Wales, and Littlehampton Book Services take over distribution. John Agard joins Bloodaxe with From the Devil’s Pulpit, Jean ‘Binta’ Breeze with On the Edge of an Island, Ruth Fainlight with Sugar-Paper Blue, and Barry MacSweeney with The Book of Demons. Imtiaz Dharker’s Postcards from god is her first UK publication. Bloodaxe’s New Blood poets tour launches Roddy Lumsden’s debut, Yeah Yeah Yeah, and Maura Dooley’s Making for Planet Alice showcases a new generation of women poets. Selima Hill publishes Violet. Tomas Tranströmer’s New Collected Poems updates his output. Denise Levertov dies at 76, before completing her final collection, later published as This Great Unknowing: Last Poems. 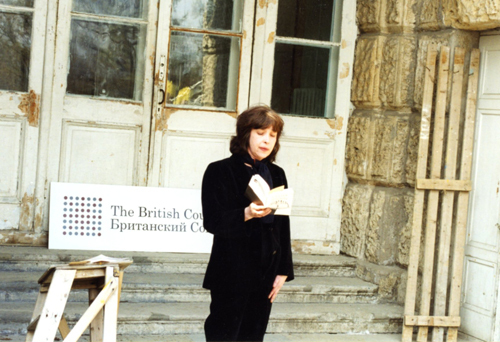 Elena Shvarts reading outdoors at Tsarskoe Selo, near St Petersburg, during the British-Russian Poetry Festival in May 1998. 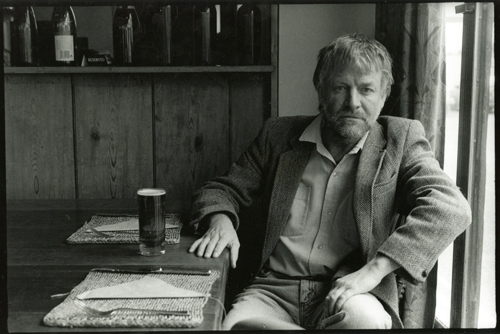 1998: Sean O’Brien surveys contemporary British and Irish poetry in The Deregulated Muse. Philip Gross moves to Bloodaxe with The Wasting Game, poems on his daughter’s anorexia. Brendan Kennelly survives open heart surgery to write The Man Made of Rain. Jack Mapanje’s Skipping Without Ropes is his book since his release from prison in Malawi. Clare Pollard is Bloodaxe’s youngest debutant at 19 with The Heavy-Petting Zoo. Ken Smith’s Wild Root is his last collection. Chris Agee’s Scar on the Stone is a multi-ethnic anthology of Bosnian Serb, Muslim and Croat poets from war-torn Bosnia. The Poetry Quartets cassette series is launched with the British Council, who also organise the British-Russian Poetry Festival bringing together Russian poets with Bloodaxe British poets in Moscow, St Petersburg, Ekaterinberg and (Ken Smith only) Tbilisi. Christine Macgregor joins Bloodaxe as publicity manager, and the Northumberland office moves to the Old Signal Box at Falstone. 1999: J.H. Prynne’s Poems is the first of three Bloodaxe retrospectives by the Cambridge modernist. Neil Astley’s New Blood is the sequel anthology to Poetry with an Edge. Chase Twichell joins Bloodaxe with The Snow Watcher and Stewart Conn with his Stolen Light. Translations include J. Kates’s Russian anthology In the Grip of Strange Thoughts, and books by Yang Lian, György Petri and Attila József. Debuts include Amanda Dalton, Frieda Hughes and Nick Drake, winner of the Forward Prize for Best First Collection for The Man in the White Suit. C.K. Williams wins a Pulitzer Prize for Repair. Peter Reading plays dead in Ob. and Oxford University Press kills off its much esteemed poetry list. 2000: The Bloodaxe stable is expanded to include titles by six ex-OUP poets: Fleur Adcock Poems 1960-2000, Moniza Alvi’s Carrying My Wife and Basil Bunting’s Complete Poems (plus Briggﬂatts cassette), and new collections by Anne Stevenson, Carole Satyamurti and George Szirtes. Funding from the National Lottery’s Millennium Festival supports an educational project based around Edna Longley’s Bloodaxe Book of 20th Century Poetry and Strong Words: Modern Poets on Modern Poetry (ed. W.N. Herbert & Matthew Hollis). There are debut collections from Polly Clark, Jane Griffiths and Joanne Limburg. The Northumberland office moves to a converted stable/granary behind Highgreen Manor in the Tarset valley. Barry MacSweeney dies, aged 51, after a lifelong battle with alcoholism, dramatised in The Book of Demons (1997). R.S. 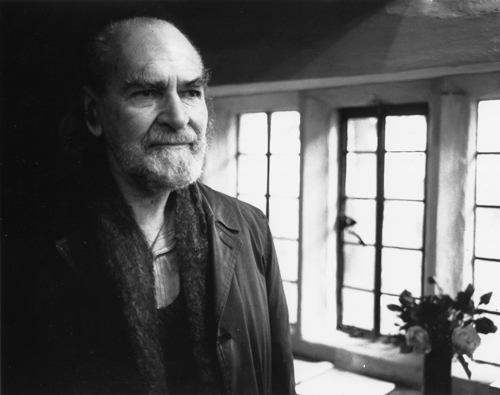 Thomas dies at 87, leaving a sheaf of unpublished poems later published as Residues. 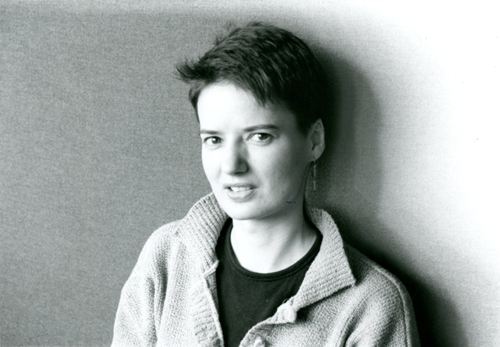 2001: Selima Hill’s Bunny wins the Whitbread Poetry Award. There are retrospectives from Helen Dunmore (Out of the Blue), Philip Gross, Galway Kinnell and Gjertrud Schnackenberg (Supernatural Love), and notable titles from Imtiaz Dharker, Menna Elfyn and George Szirtes. 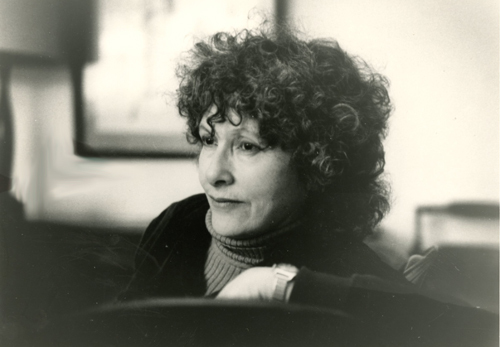 Denise Levertov’s final collection This Great Unknowing and Marin Sorescu’s Censored Poems are both published posthumously. Other translations include Evgeny Rein and Pia Tafdrup. Debuts include Esther Morgan and Caitríona O’Reilly. Jo Shapcott gives the first series of Newcastle/Bloodaxe Poetry Lectures. Peter Reading is the only poet to read an entire life’s work for the Lannan Foundation’s DVD archive – his filmed readings for Lannan (made in 2001 and 2010) of 26 poetry collections make up the only archive of its kind in the world. Pamela Gillilan dies at 82 after a writing life begun at 60. 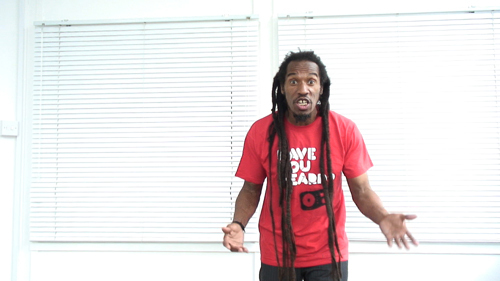 Benjamin Zephaniah is Too Black Too Strong. 2002: Neil Astley’s Staying Alive: real poems for unreal times is a new phenomenon: praised by all kinds of readers but attacked by elitist critics, it becomes a bestseller. Ken Smith’s Shed: Poems 1980-2001 is his final compilation, while R.S. Thomas’s posthumously published Residues is his last collection. Other retrospectives include books by Maura Dooley, G.F. Dutton and Kathleen Jamie. David Constantine has Something for the Ghosts, Frieda Hughes shows her Waxworks, and Helen Ivory makes her debut with The Double Life of Clocks. Meryl Streep and Neil Astley sign copies of Staying Alive for each other at the New York launch of the anthology’s US edition. 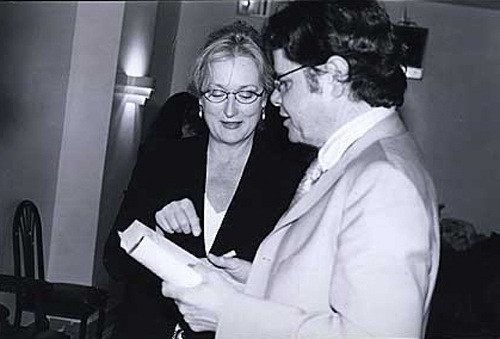 2003: Meryl Streep, Claire Danes and a phalanx of celebrated poets launch the American edition of Staying Alive (from Miramax) at the Cooper Union in New York. There are retrospectives from Peter Didsbury, Peter Reading, Pauline Stainer and Susan Wicks, as well as posthumous selections by Barry MacSweeney and Denise Levertov, new collections from Carolyn Forché, Gwyneth Lewis and Anne Stevenson, and Sarah Wardle’s debut, Fields Away. Translations include The Bloodaxe Book of Modern Welsh Poetry and Osip Mandelstam’s Moscow & Voronezh Notebooks. Ken Smith dies after contracting Legionnaires’ disease in Cuba. Jonathan Davidson’s Midland Creative Projects produces Staying Alive, the first several touring poetry shows based on Bloodaxe titles and directed by Steve Byrne. Rebecca Hodkinson joins Bloodaxe as publishing assistant. 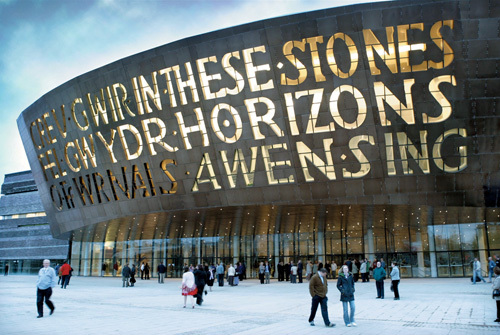 The Wales Millennium Centre in Cardiff, opened in 2004, with words by Gwyneth Lewis. 2004: Being Alive, Neil Astley’s sequel to Staying Alive, appears with Mary Oliver’s first UK selected, Wild Geese. Selina Guinness’s The New Irish Poets showcases a new generation of Irish poets, including Leanne O’Sullivan, who publishes her debut, Waiting for My Clothes, at 21. Other debuts include Matthew Hollis, Cheryl Follon, Choman Hardi and Kona Macphee. David Constantine and Carol Rumens publish collected editions, and there are selecteds from Australia’s Robert Adamson (his first UK publication), and from Paul Hyland, Brendan Kennelly, Roddy Lumsden, Jack Mapanje and Eva Salzman. Translations include Maram al-Massri, Catullus, Jaan Kaplinski, Ágnes Nemes Nagy and Tatiana Shcherbina. Ken Smith’s last poems appear in You Again, and Marin Sorescu’s deathbed poems in The Bridge. R.S. Thomas’s last five collections are combined in his Collected Later Poems. George Szirtes wins the T.S. Eliot Prize for 2014 with Reel. Suzanne Fairless-Aitken joins Bloodaxe as rights manager. Gwyneth Lewis composes the words on the front of the Wales Millennium Centre in Cardiff. George Szirtes is the first Bloodaxe winner of the T.S. Eliot Prize in 2004. 2005: Major retrospectives include J.H. Prynne’s Poems (second edition), Roy Fisher’s The Long and the Short of It: Poems 1955-2005 (first edition) and Anne Stevenson’s Poems 1955-2005; there are selecteds from Rita Ann Higgins, Gwyneth Lewis and Carole Satyamurti, and from American poets Jane Hirshfield, Tony Hoagland and Jane Kenyon; translations of Piotr Sommer and Yang Lian; and debuts by Jen Hadfield and Sally Read. Deryn Rees-Jones publishes her critical study, Consorting with Angels, with a companion anthology, Modern Women Poets, and Robyn Bolam produces Eliza’s Babes: four centuries of women’s poetry in English, c. 1500-1900. Neil Astley turns on elitist critics in his influential 2005 StAnza lecture, ‘Bile, Guile and Dangerous to Poetry’. Midland Creative’s Being Alive poetry show premières at Warwick Arts Centre before touring the UK. Bethan Jones joins Bloodaxe as finance manager. 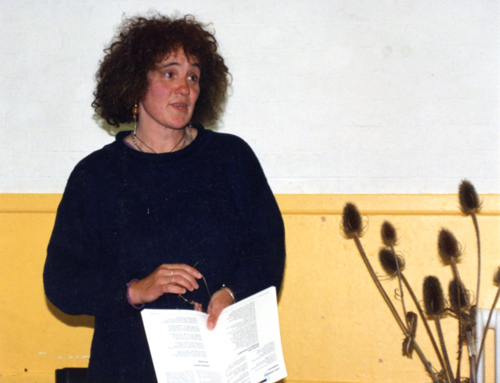 Gwyneth Lewis is appointed Wales’s first National Poet. 2006: Four retrospectives appear from major American poets, Elizabeth Alexander, Jack Gilbert, Philip Levine and C.K. Williams (Collected Poems), along with an expanded Miroslav Holub (Poems Before & After), Andrew Greig’s This Life, This Life, and the late Martin Carter’s University of Hunger: Collected Poems & Selected Prose. Dennis O’Driscoll gives us The Bloodaxe Book of Poetry Quotations. W.N. Herbert has the Bad Shaman Blues, Penelope Shuttle is Redgrove’s Wife, John Agard is one of We Brits, and Imtiaz Dharker welcomes The terrorist at my table. Translations include Tua Forsström, Joan Margarit and Tatiana Voltskaia. Clare Shaw’s first collection is Straight Ahead. Fleur Adcock is awarded the Queen’s Gold Medal for Poetry for 2006 (presented to her by H.M. The Queen in 2007). Pamela Robertson-Pearce begins filming Bloodaxe poets. Neil Astley tries to visit ‘disappeared poet’ Rosemary Tonks in Bournemouth. Anne Stevenson, winner of three major literary awards in the US in 2007. 2007: Two bilingual editions appear from major Palestinian poets, Mahmoud Darwish and Taha Muhammad Ali, the latter receiving a standing ovation at Aldeburgh Poetry Festival. Ex-US soldier Brian Turner gives a harrowing, ﬁrst-hand account of the Iraq War in Here, Bullet. Here, Bullet Galway Kinnell’s Strong Is Your Hold is the first Bloodaxe title published with an audio CD. Retrospectives include selecteds from America’s Li-Young Lee, W.S. Merwin and C.D. Wright, and from Gillian Allnutt, Robyn Bolam, Menna Elfyn and Jackie Kay. Neil Astley’s latest anthologies are Earth Shattering: eco poems and (with Pamela Robertson-Pearce) Soul Food. Suzanne Batty and Zoë Brigley publish debut collections. Anne Stevenson receives three major prizes in her native USA, including the $200,000 Lannan Lifetime Achievement Award for Poetry and only the second Neglected Masters Award given by the Poetry Foundation. 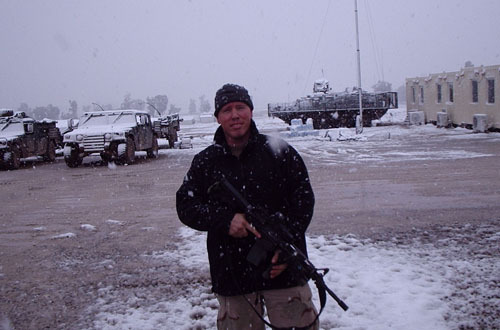 Brian Turner, a serving soldier with the US Army when writing the poems of Here, Bullet (2007). 2008: Bloodaxe celebrates its 30th birthday. In Person: 30 Poets, filmed by Pamela Robertson-Pearce, is the world’s first DVD-anthology: six hours of readings on two DVDs with a book containing all the poems. There are retrospectives from Moniza Alvi (plus a new collection, Europa), Annemarie Austin, Janet Frame, Jane Griffiths, Selima Hill (Gloria), Naomi Shihab Nye, Julie O’Callaghan, Anne Rouse and George Szirtes; translations of Esther Jansma, Elena Shvarts, Tomas Venclova and Yi Sha; and debuts from Paul Batchelor and Stephanie Norgate. Jeet Thayil edits The Bloodaxe Book of Contemporary Indian Poets and Edna Longley produces her Annotated Collected Poems of Edward Thomas. Midland Creative’s Changing Lives (drawn from many Bloodaxe titles) poetry show premières at Warwick Arts Centre before touring the UK. Elizabeth Bartlett dies, aged 84. Adrian Mitchell dies just before Christmas, aged 76. Jen Hadﬁeld’s Nigh-No-Place wins the 2008 T.S. Eliot Prize. Jean Smith joins Bloodaxe as maternity cover for Bethan Jones, staying on to work on sales and royalties. 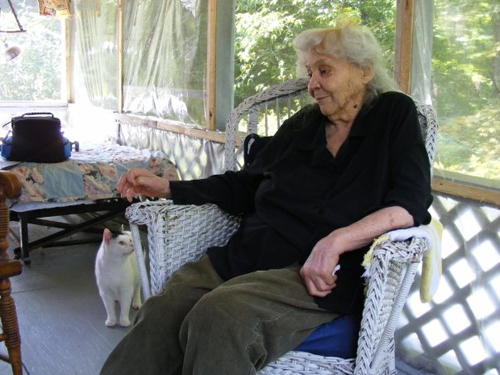 Ruth Stone (with Jean-Louis) filmed in Vermont by Pamela Robertson-Pearce for Bloodaxe’s film project in 2008 and (pictured here) in 2009: now aged 93 and 94 and almost blind, she speaks all her poems from memory. 2009: John Agard’s Alternative Anthem is published with a live performances DVD, while Samuel Menashe’s New & Selected Poems includes Pamela Robertson-Pearce’s film portrait on DVD. Ruth Stone’s What Love Comes To is the 93-year-old American poet’s first UK publication. A new edition of Basil Bunting’s Briggflatts includes a CD of a 1967 reading and a DVD of Peter Bell’s 1982 film portrait. Clare Pollard and James Byrne’s Voice Recognition showcases 21 emerging new poets. Other key titles include Arundhathi Subramaniam’s Where I Live; Grace Nichols’s Picasso, I Want My Face Back; Bernardine Evaristo’s revamped verse novel, Lara; Yang Lian’s Lee Valley Poems; and Adrian Mitchell’s last collection, Tell Me Lies, launched with a musical and poetical celebration of his life and work at the Queen Elizabeth Hall in London. There are new collections from David Constantine, Imtiaz Dharker, Selima Hill, Brendan Kennelly and George Szirtes, and Patrick Brandon’s debut. Philip Gross’s The Water Table wins the 2009 T.S. 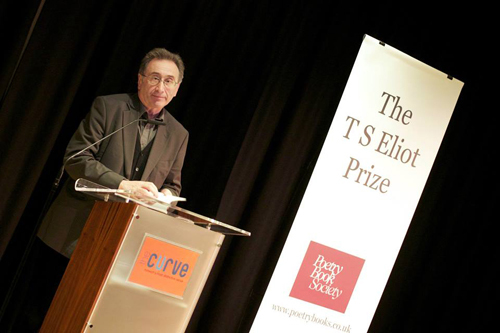 Eliot Prize, and W.S. Merwin’s The Shadow of Sirius wins him his second Pulitzer Prize. 2010: Roddy Lumsden’s Identity Parade is the first major anthology of British and Irish poets who’ve emerged since the mid-90s, while Ten: new poets from Spread the Word reflects the multicultural make-up of contemporary Britain. Other key titles include Collected Poems in English by the late Arun Kolatkar; Peter Reading’s parting shot, Vendange Tardive; and Gwyneth Lewis’s A Hospital Odyssey. There are retrospectives from Katie Donovan, Ruth Fainlight, Grace Nichols, Lawrence Sail, Louis Simpson (USA), Chase Twichell (USA) and Priscila Uppal (Canada), plus a reissue of neglected poet A.S.J. Tessimond’s 1985 Collected Poems; and translations of Sylva Fischerová, Harry Martinson, Pablo Neruda and Pia Tafdrup. Soldier-poet Brian Turner returns with Phantom Noise, Fleur Adcock publishes her first book for ten years, Dragon Talk, and Miriam Gamble makes her debut. Roy Fisher’s Standard Midland wins the Costa Poetry Award. W.S. Merwin becomes U.S Poet Laureate for 2010-11 at the age of 83. 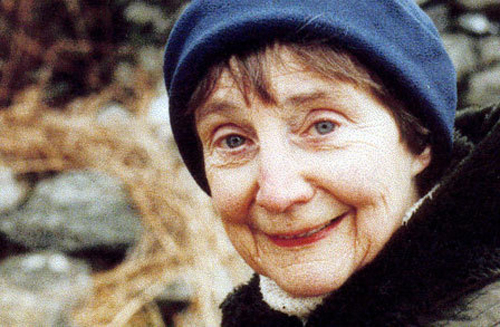 Still writing some of her best work in her 80s and 90s, Ruth Stone dies at the age of 96. Elena Shvarts dies from cancer, aged 61. 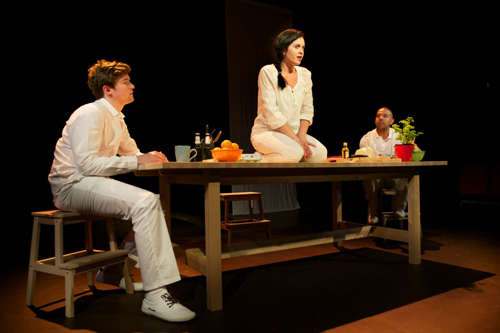 Actors Ben Hastings, Elinor Middleton and Barrett Robertson in Midland Creative Projects' touring production of Being Human. 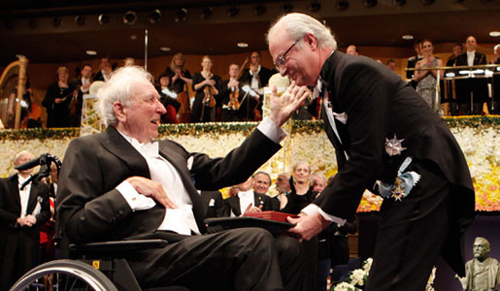 2011: An expanded edition of Tomas Tranströmer’s New Collected Poems is published for his 80th birthday in April; in December he is awarded the Nobel Prize in Literature. Gjertrud Schnackenberg wins the Griffin International Poetry Prize for her Heavenly Questions. 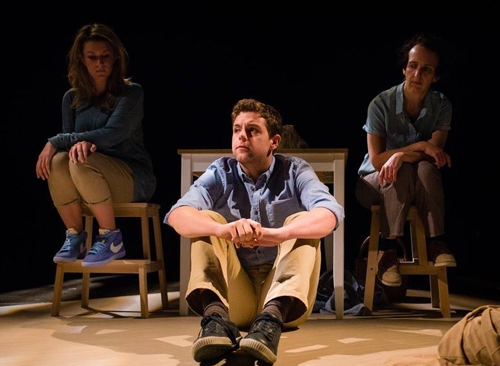 Being Human is the third anthology in Neil Astley’s Staying Alive trilogy, launched alongside a national tour of Midland Creative’s Being Human poetry show premièred at Coventry’s Belgrade Theatre. Jean ‘Binta’ Breeze’s Third World Girl is published with a live performances DVD, and three titles – by Frances Horovitz, Garrison Keillor and Brendan Kennelly – all have audio CDs; The Essential Brendan Kennelly is also Bloodaxe’s first enhanced e-book with audio. There are translations of Jaan Kaplinski, Luljeta Lleshanaku, Joan Margarit, Jules Supervielle; retrospectives by James Berry, Kerry Hardie and Robert Hass, plus Peter Robinson’s new edition of Bernard Spencer; and five debut collections (Ailbhe Darcy, Kate Potts, Jacob Sam-La Rose, Ahren Warner and Heidi Williamson). Philip Levine is appointed US Poet Laureate for 2011-12, aged 83. Samuel Menashe dies in New York, aged 85, having seen his writing career revived at 79. Peter Reading dies, aged 65. Bloodaxe starts publishing its titles in ebook as well as print formats. 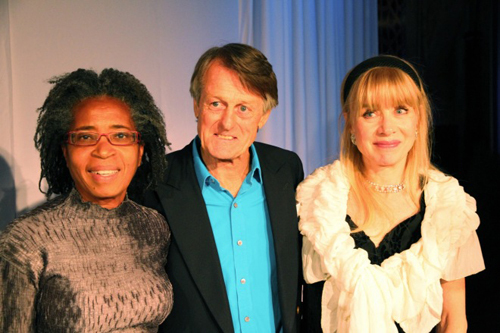 Gjertrud Schnackenberg (right), winner of the 2011 Griffin International Poetry Prize for Heavenly Questions, with Dionne Brand (left), winner of the Canadian Prize, and Griffin Prize founder Scott Griffin. 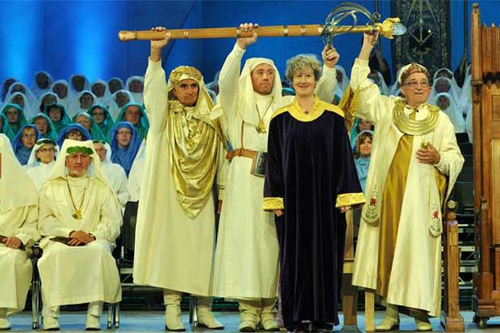 Gwyneth Lewis wins the Crown at the 2012 National Eisteddfod for her Welsh poetry (Y Fran) after winning the Roland Mathias Prize (Welsh Book of the Year) for her Bloodaxe collection Sparrow Tree. 2012: Bloodaxe produces The World Record anthology featuring work by poets from all the countries taking part in the 2012 London Olympics, including 200 who took part in Southbank Centre’s Poetry Parnassus festival, part of the Cultural Olympiad. Other anthologies include Jade Ladder: contemporary Chinese poetry, Essential Poems from the Staying Alive Trilogy and Out of Bounds: British Black & Asian Poets. Korea’s Ko Un receives a standing ovation at Aldeburgh Poetry Festival for his reading from First Person Sorrowful, his first UK poetry publication. Three Australian poets, J.S. Harry, Jennifer Maiden and Gig Ryan, also publish their first UK poetry titles. Other notable books include retrospectives from Connie Bensley, Roy Fisher (updated), Tess Gallagher, Adrian Mitchell (posthumous) and Penelope Shuttle; Anne Carson’s Antigonick (inventively illustrated by Bianca Stone) and Anne Stevenson’s Astonishment (possibly her best collection in 50 years); new collections from poets including Harry Clifton, Helen Dunmore, Menna Elfyn (bilingual), Selima Hill and Jane Hirshfield; and Sarah Jackson’s debut, Pelt. Faber takes on Bloodaxe’s booktrade sales representation with distribution moving from Littlehampton (LBS) to Macmillan (MDL). 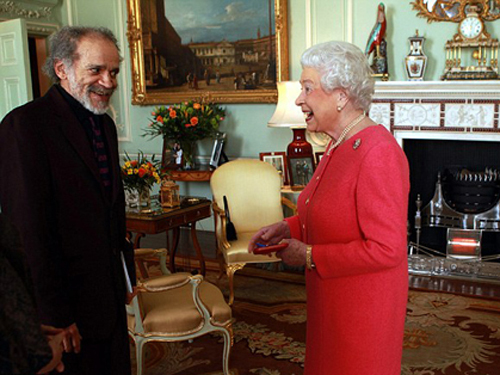 John Agard receives the Queen’s Gold Medal for Poetry for 2012 (presented to him by H.M. The Queen in 2013). Jack Gilbert dies, aged 87. Benjamin Zephaniah performing in Midland Creative Projects’ office in the Old Custard Factory in Birmingham during the filming of To Do Wid Me. 2013: Bloodaxe publishes its first full-length feature film, Pamela Robertson-Pearce’s To Do Wid Me: Benjamin Zephaniah, released on DVD with Zephaniah’s book of the poems included in the film. W.N. (Bill) Herbert publishes his Omnesia, the first poetry collection to appear in twin editions, the Alternative Text and the Remix, and the provocative Nathan Hamilton shakes things up with his combative anthology Dear World & Everyone In It: new poetry in the UK. The illuminating correspondence of Tomas Tranströmer and Robert Bly appears in Airmail, half a century after they started writing to each other, while the publication of R.S. Thomas’s Uncollected Poems marks the centenary of his birth. In Ireland, Matthew Sweeney brings his Horse Music to Bloodaxe; Brendan Kennelly gives us his Guff; and Micheal O’Siadhail launches his mammoth Collected Poems (with audio CD). Other retrospectives include books by Richard Murphy and Robert Wrigley; John Hegley’s New & Selected Potatoes; and Adrienne Rich’s Selected Poems of Muriel Rukeyser. Two poets signed up at Poetry Parnassus in 2012, Nikola Madzirov (Macedonia) and Karen Solie (Canada), publish their first UK poetry titles, giving readings at Aldeburgh, Hull and Newcastle with Robert Wrigley. Other titles include new collections from Fleur Adcock, Moniza Alvi (Eliot shortlisted), Philip Gross, Pauline Stainer, George Szirtes (Eliot shortlisted) and C.K. Williams; debuts from Hannah Lowe (who started writing poetry after her mother gave her a copy of Staying Alive), Maitreyabandhu and Heather Phillipson; and Clare Pollard’s translation of Ovid’s Heroines, adapted by Julia Bird into a touring theatre show. 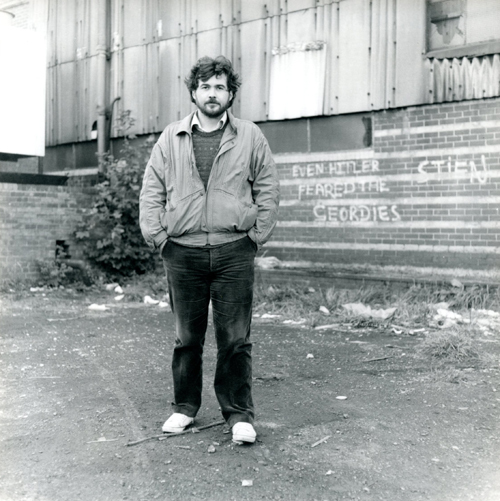 Niall Campbell wins the inaugural Edwin Morgan Poetry Award. 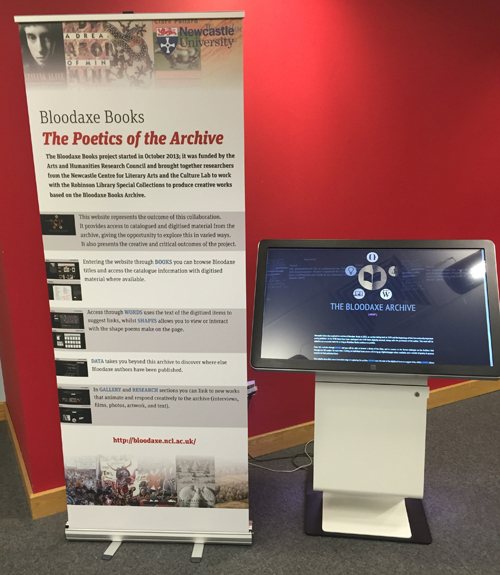 Bloodaxe’s archive is acquired by Neil Astley and Simon Thirsk's alma mater, Newcastle University, which sets up an AHRC-funded creative and educational project, The Poetics of the Archive, and the Bloodaxe Archive website. 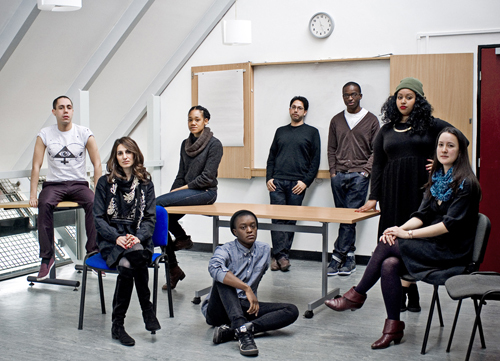 New and emerging poets from The Complete Works II, the second phase of a groundbreaking initiative to promote diversity and equality in British poetry. Their anthology Ten: the new wave is published by Bloodaxe in 2014. Actors Jill Dowse, Miriam Edwards and Zachary Price in Midland Creative Projects’ touring production of The Hundred Years’ War. 2014: The poetry world learns what actually happened to ‘disappeared poet’ Rosemary Tonks when Neil Astley writes her obituary for The Guardian; six months after her death at 85, Bloodaxe makes her work available again for the first time in 40 years in Bedouin of the London Evening (also as an e-book with audio including Tonks’s own readings recorded in 1963). The centenary of the outbreak of the First World War sees the publication of Astley’s anthology, The Hundred Years’ War: modern war poems, launched alongside a national tour of Midland Creative’s poetry show, The Hundred Years’ War: from the Somme to Afghanistan, premièred at Coventry’s Belgrade Theatre. Sarah Maguire’s My Voice: A Decade of Poems from the Poetry Translation Centre is a multilingual anthology with translations from 23 languages. Ten: the new wave is the second anthology from The Complete Works mentoring project. Other notable books include retrospectives from Harry Clifton, Stewart Conn, W.S. Merwin, David Scott and Thomas Lux; translations of Ana Blandiana (plus e-book with audio), Louis de Paor (plus e-book with audio), Kim Hyesoon (the third international name signed up at Poetry Parnassus), and Adélia Prado (who visits the UK for the first time, giving readings at Aldeburgh, Hull and Newcastle with Thomas Lux); and new collections from Tiffany Atkinson, David Constantine, Selima Hill, Katrina Porteous (plus e-book with audio) and Kit Wright. Arundhathi Subramaniam is shortlisted for the T.S. Eliot Prize. Debutants Niall Campbell and Vidyan Ravinthiran are shortlisted for several first collection prizes, Campbell picking up the Scottish First Book of the Year Award. 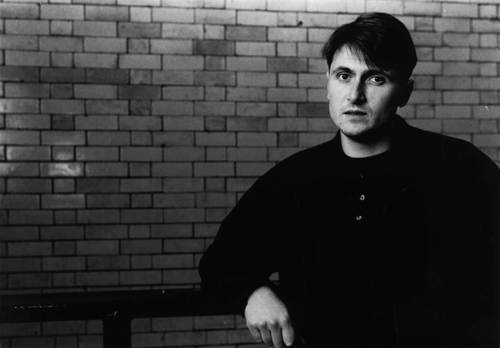 A 25th anniversary e-book with audio edition of Simon Armitage’s Zoom! (with 1989 archive recording) is released, along with Tony Harrison’s v. John Agard appears on Desert Island Discs. Imtiaz Dharker publishes her fifth Bloodaxe title, Over the Moon, and is awarded the Queen’s Gold Medal for Poetry for 2014 (presented to her by H.M. The Queen in 2013). Galway Kinnell dies from leukaemia, aged 87. Imtiaz Dharker on Desert Island Discs within months of receiving the Queen's Gold Medal for Poetry. 2015: Anthony Wilson’s blog Lifesaving Poems becomes a bestselling poetry anthology from Bloodaxe. Raving Beauties take to the road with their comeback anthology, Hallelujah for 50ft Women. J.H. Prynne’s monumental Poems passes 700 pages in its third edition. Frieda Hughes’s Alternative Values is Bloodaxe’s first book of poems and paintings. There are translations of Hans Magnus Enzensberger, Tua Forsström, Lars Gustafsson and Pia Tafdrup; and new collections from Fleur Adcock, Philip Gross, Jane Hirshfield, Selima Hill, Caitríona O’Reilly, Micheal O’Siadhail and Matthew Sweeney, and from ex-Anvil poets A.B. 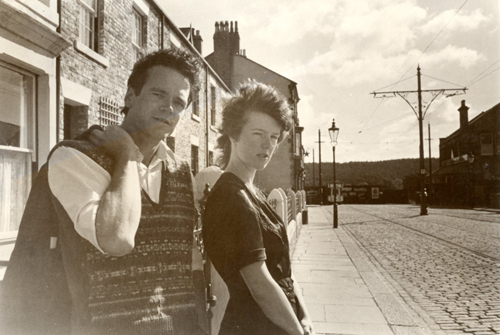 Jackson and Greta Stoddart, plus Frank Ormsby’s Goat’s Milk: New & Selected Poems. First collection poets are Rebecca Perry, Shazea Quraishi, and Jane Clarke, whose debut, The River, gets so much attention in her native Ireland that it sells out before publication and is reprinted within a week. Naomi Shihab Nye launches an expanded Tender Spot at Cúirt in Galway, Aldeburgh Proms and Edinburgh International Book Festival. Korea’s Ko Un reads from Maninbo in Ledbury and London. Kim Addonizio, Choman Hardi and Tony Hoagland launch new books at Aldeburgh followed by readings in Hull, Newcastle and elsewhere. On World Book Night in April, 12,500 copies of Essential Poems from the Staying Alive Trilogy are given away free, part of a promotion organised by the Reading Agency in which volunteers give away hundreds of thousands of books in their communities to share their love of reading with people who don’t read for pleasure or own books. Essential Poems is the first poetry anthology to be included in this initiative to reach the 35% of the adult population that doesn’t read for pleasure. 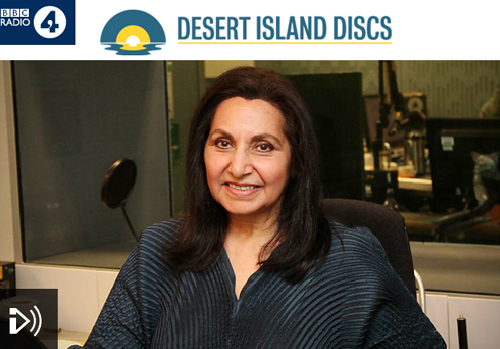 Imtiaz Dharker appears on Desert Island Discs. Tracey Herd, Selima Hill and Rebecca Perry are shortlisted for the T.S. Eliot Prize. Tomas Tranströmer dies, aged 83, after 25 years of ill health which left him unable to speak and partly paralysed, following a stroke in 1990. J.S. (Jann) Harry dies aged 76, after many years of ill health; Philip Levine dies, aged 87, and C.K. Williams, aged 78, both from cancer. 2016: Imtiaz Dharker and Jackie Kay join Carol Ann Duffy and Gillian Clarke on Shore to Shore, a nationwide reading tour to independent bookshops over 14 consecutive days in June and July. Jackie Kay is appointed Makar, National Poet of Scotland, for five years, and appears on BBC Radio 4’s Desert Island Discs. Imtiaz Dharker appears on several BBC radio programmes, and her recent collection, Over the Moon (2014), is Amazon’s no.1 poetry bestseller at different times over the year. Louis de Paor’s Irish language anthology, Leabhar na hAthghabhála / Poems of Repossession, is a poetry bestseller in Ireland. Jean ‘Binta’ Breeze takes to the road to launch The Verandah Poems, and is featured on BBC Radio 4’s Pick of the Week. R.S. Thomas’s previously unknown poems on modern art are published in the beautifully illustrated Too Brave to Dream. Ledbury Poetry Festival’s 20th year is marked with Mark Fisher’s anthology Hwaet!, and Modern Poetry in Translation’s 50th birthday is celebrated with Centres of Cataclysm. There are translations of Joan Margarit, his third from Bloodaxe, and Al-Saddiq Al-Raddi, the first in a series co-published with the Poetry Translation Centre. Beyond the Water’s Edge is the sixth Midland Creative Projects’ touring production (2016-17) in partnership with Bloodaxe Books, this time dramatising poems from Bloodaxe’s numerous editions of poetry in translation. Two brilliant performers join Bloodaxe, Mark Waldron from Salt with his third collection, Meanwhile, Trees, and MacGillivray from Pighog with her second collection, The Nine of Diamonds. There are new collections from Matthew Caley, Maura Dooley, Selima Hill, Rita Ann Higgins, Jack Mapanje, John Agard, Robert Adamson, Susan Wicks, Katie Donovan, Helen Farish, W.S. Merwin, George Szirtes (Poetry Book Society Choice) and Roy Fisher, second collections from Hannah Lowe and Heidi Williamson, and debut collections by Claire Askew and Amali Rodrigo as well as by soldier mothers Bryony Doran and Isabel Palmer included in Home Front with parallel collections by US military wives Jehanne Dubrow and Elyse Fenton. Ana Blandiana is given the European Poet of Freedom Award in Gdansk. Caitríona O'Reilly wins the Irish Times – Poetry Now Award for her collection Geis (2015). Philip Gross wins the Roland Mathias Poetry Award (Welsh book of the Year) for his Love Songs of Carbon. Gillian Allnutt receives the Queen's Gold Medal for Poetry (to be presented to her by H.M. the Queen in 2017). C.D. Wright dies, aged 67, from thrombosis, following a long flight from Chile to the US. Helen Dunmore’s family, Frank, Tess and Patrick Charnley, receiving her posthumous Costa Book of the Year Award. 2017: Helen Dunmore dies from cancer, aged 64. Her final collection Inside the Wave is the posthumous winner of both the Costa Poetry Award and Costa Book of the Year. C.K. Williams’s Falling Ill is his final, posthumously published collection. Pascale Petit’s first title with Bloodaxe, her seventh collection, Mama Amazonica, is a Poetry Book Society Choice. Roddy Lumsden’s tenth collection So Glad I’m Me is shortlisted for the T.S. Eliot Prize. Frank Ormsby is shortlisted for a National Book Circle Critics Award in the US for The Darkness of Snow, and for the Christopher Ewart-Biggs Memorial Prize for Goat’s Milk, and is guest of honour at BBC Proms in the Park with his poems recited by actor Adrian Dunbar. The lost poems of Pablo Neruda are published in Then Come Back (shortlisted for the Oxford-Weidenfeld Translation Prize). The DVD-anthology In Person: World Poets includes 15 hours of films of 59 poets from around the world, filmed and edited by Pamela Robertson-Pearce and Neil Astley, with a highlights film shown at several festivals. Yang Lian’s major work, Narrative Poem, is published in a dual language Chinese-English edition after being banned in China; other translations are by Ana Blandiana (Romanian), Menna Elfyn (Welsh language original) and Asha Lul Mohamud Yusuf (Somali-English dual language). The Mighty Stream: poems in celebration of Martin Luther King marks the 50th anniversary of MLK’s visit to Newcastle University to receive honorary doctorate in law just months before his assassination. Ten: poets of the new generation is the third Complete Works anthology in their Ten series of new poets from diverse backgrounds. Neil Astley’s historic anthology Land of Three Rivers: the poetry of North-East England is launched at Sage Gateshead by Kathryn Tickell with songs and readings by artists including The Lake Poets and Jimmy Nail. Anne Stevenson’s Newcastle/Bloodaxe poetry lectures are published in About Poems and how poems are not about. There are new collections from Fleur Adcock, Robyn Bolam, Harry Clifton, Cheryl Follon, Jane Griffiths, Philip Gross, Selima Hill, Joanne Limburg, Grace Nichols, Clare Pollard, Penelope Shuttle, Pauline Stainer and Ahren Warner (his third consecutive PBS Recommendation), and debut collections by Nia Davies (shortlisted for Roland Mathias Poetry Award in Wales Book of the Year Awards in 2018), Wayne Holloway-Smith (shortlisted for Roehampton and Seamus Heaney prizes), Miriam Nash (Roehampton-shortlisted) and Chrissy Williams. Rebecca Perry wins the 2017 Michael Murphy Prize for Beauty/Beauty (2016). Jamie McKendrick wins the John Florio Prize for his translation of Antonella Anedda’s Archipelago (2014). Katie Donovan wins the O’Shaughnessy Poetry Award given to distinguished Irish poets. Irina Ratushinskaya dies, aged 63, and Thomas Lux, aged 70, both from cancer; Roy Fisher dies, aged 86; James Berry dies, aged 92. 2018: Pascale Petit’s Mama Amazonica is the first poetry book to win the RSL Ondaatje Prize. Ana Blandiana receives the Griffin Trust Lifetime Recognition Award in Toronto. Abigail Parry’s debut Jinx is shortlisted for the Forward Prize for Best First Collection. Imtiaz Dharker is the London Bookfair’s first Poet of the Fair. Neil Astley is made an Honorary Fellow of the Royal Society of Literature. Jule Wilson joins Bloodaxe as marketing development officer. Jenny Joseph dies, aged 85; Richard Murphy, dies aged 90; Matthew Sweeney dies, aged 65, from motor neurone disease.